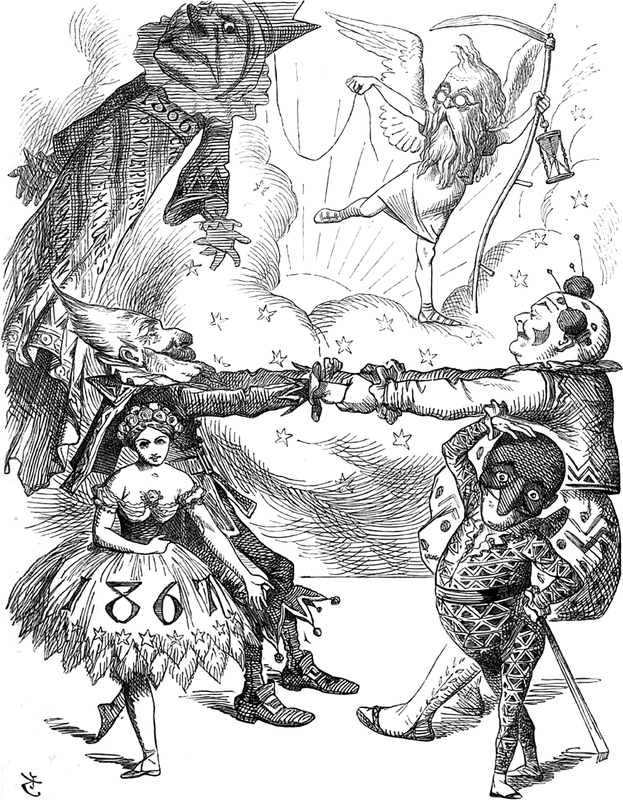 The context here is that the matronly year 1866 is on her way out, with Father Time pulling her offstage like a kite as he pirouettes a segue; the new year 1867 enters downstage as a comely danseuse, ready to pas de deux with Punchinello. But what caught our eye is the middle-ground action — two clowns maintain a tension/equilibrium (a precursor to Bosonic — er, Bozo-nic — string theory?). One is bald and stout, the other bearded and gaunt, but they joke around (literally in circles) as a concerted comedic constant. These clowns may be our favorite Yin/Yang symbol to date! 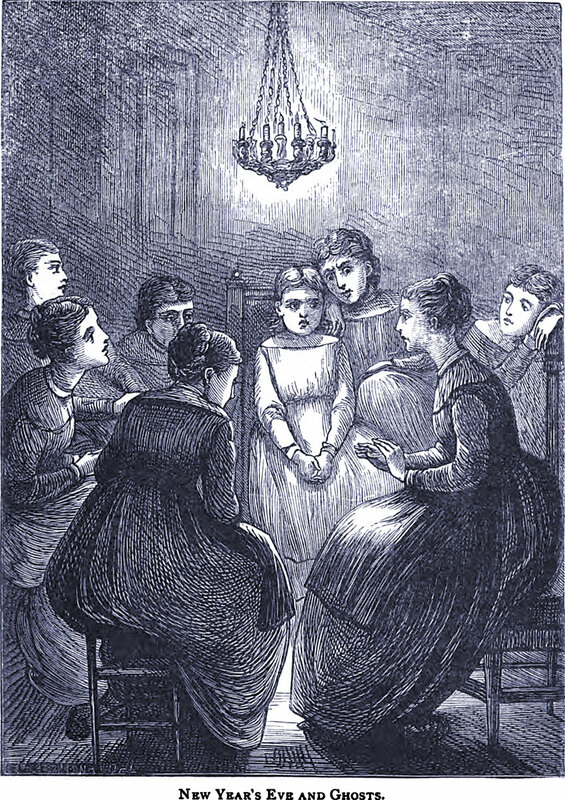 "New Year's Eve and Ghosts": an illustration from School Days in Paris by Margaret S. Jeune (1881). This should be of interest: Seance Parlor Feng Shui. 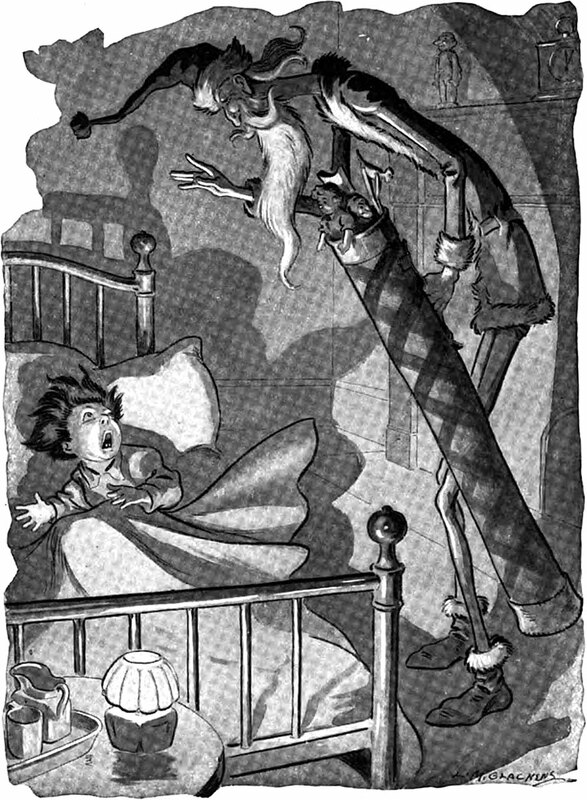 Father Time conjures the new year as the old year slinks into the shadows. 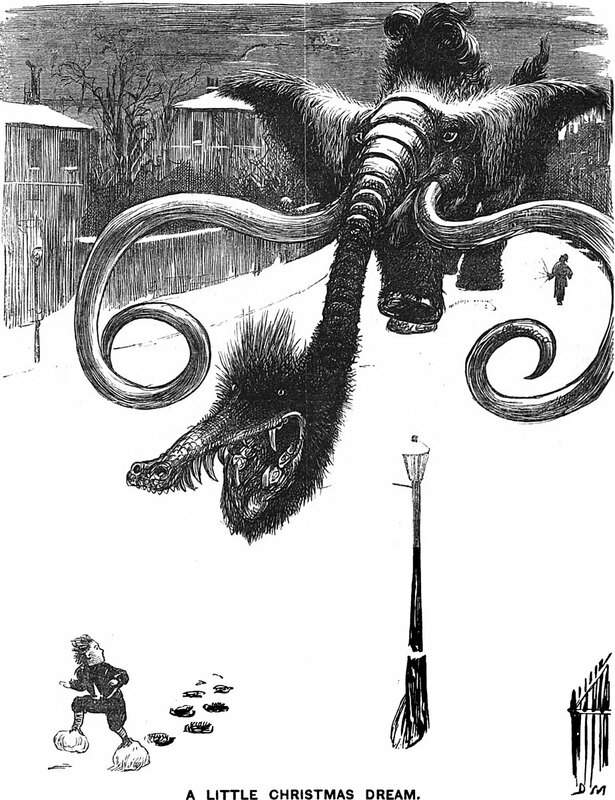 An illustration from an 1889 issue of Punch magazine. Here's a precursor to the Orwellian NSA's rampant violations of civil liberties, from The Letters of Charles Dickens, 1893. An illustration from The Black Arrow by Robert Louis Stevenson (1888). "It's only funny if he's not your cousin." > read more from Only Funny If ... . . .
First image: "Tom Rides on a Flamingo" accompanied by enchanted fireplace hardware, from The Silent Readers (1920). 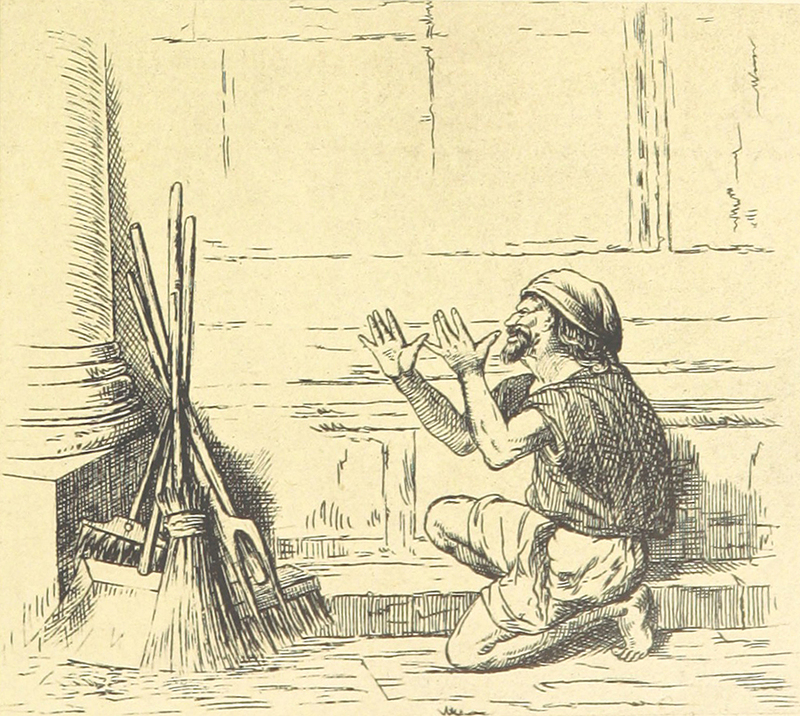 Second image: more enchanted fireplace hardware, establishing that this is "a thing," from Tales of a Traveller by Geoffry Crayon (1850). 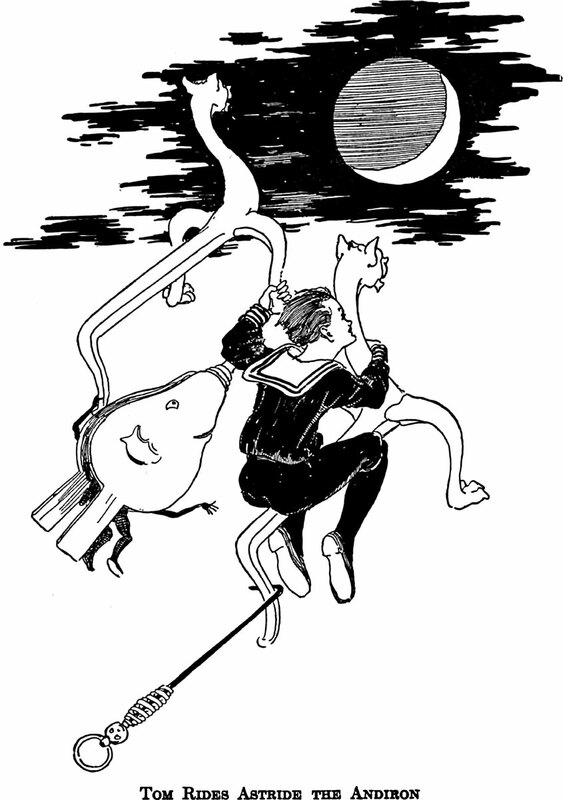 An illustration from The Master Key by L. Frank Baum (1901). 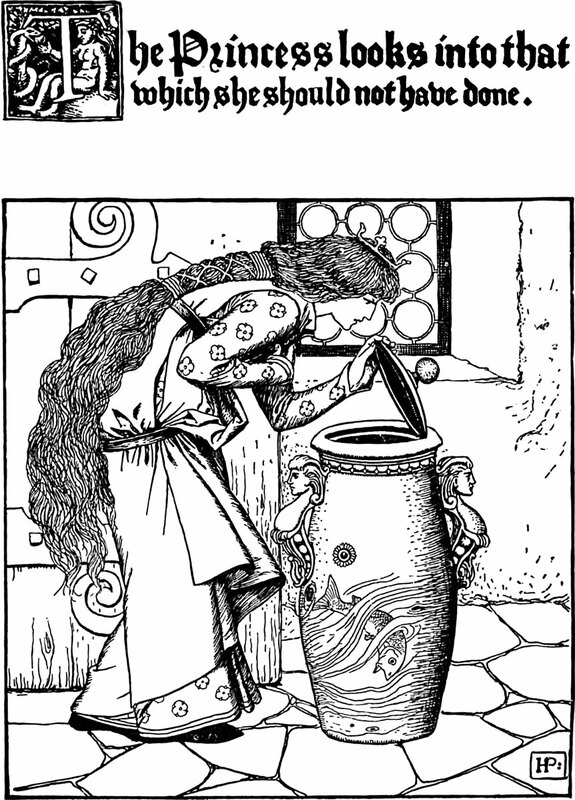 An illustration from Andiron Tales by John Kendrick Bangs and illustrated by Clare Victor Dwiggins, 1906. 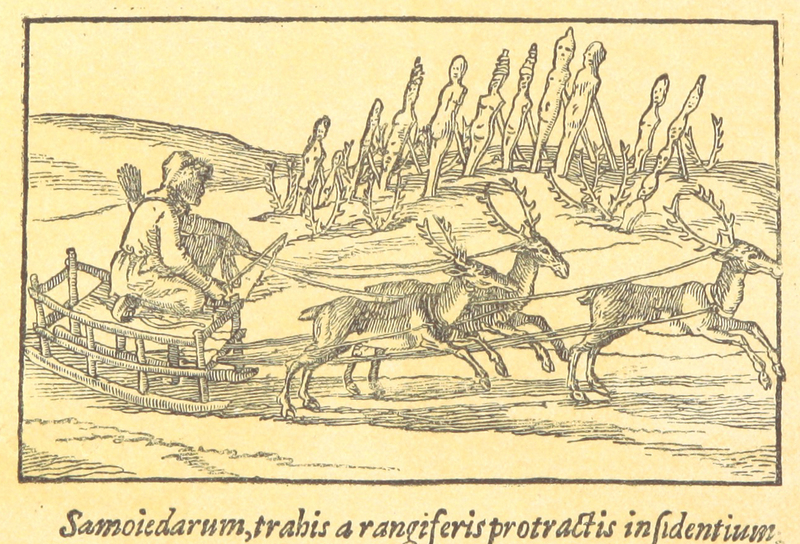 The caption reads: "Tom rides astride the Andiron." 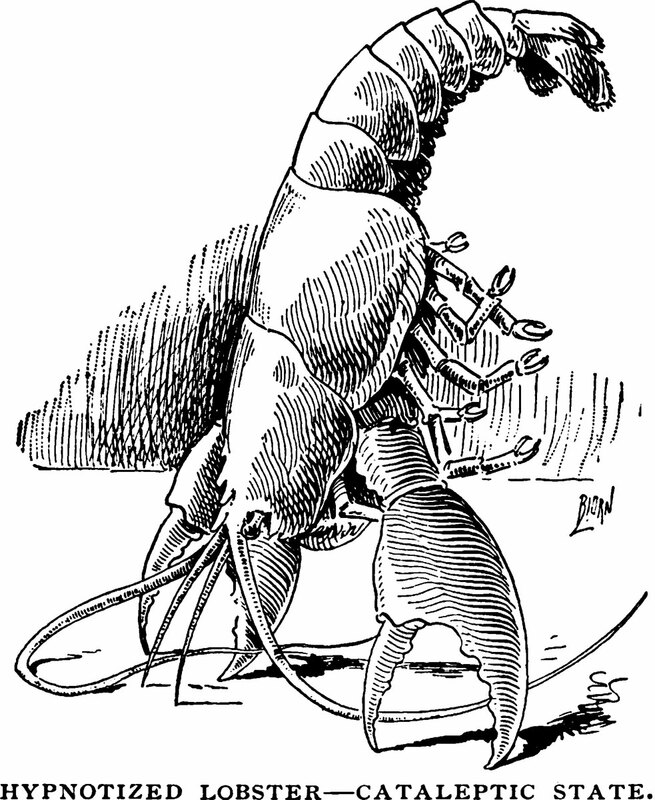 "Hypnotized Lobster—Cataleptic State": an illustration from Hypnotism: Its Facts, Theories and Related Phenomena by Carl Sextus (1893). Here's a precursor to tablets and smart phones destroying human communication, from Humorous Poems by Alfred Ainger, 1893. The caption says, "Reading,—and wept." "You may find it impossible to believe that this all depends on you, but I am willing to risk that you can accept the truth." The serpents are emblazoned with death, destruction, murder, mischief, madness, brutality, robbery, and blasphemy. From The Working Man's Friend and Family Instructor (1833). The caption reads: "Will you take a glass?" "It was only funny if you weren't the one who had to do it for ten hours a day." 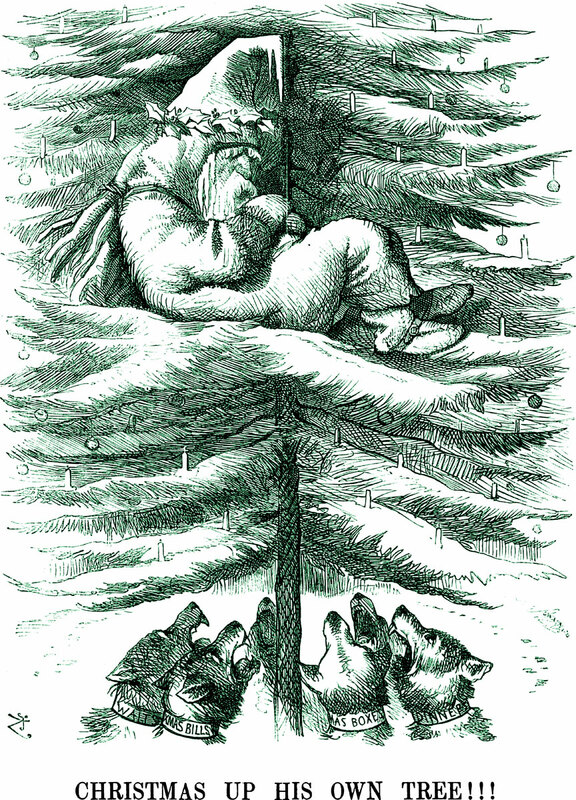 "A Little Christmas Dream": an illustration from an 1868 issue of Punch magazine. This will also be of interest: The Collected Lost Meanings of Christmas. "Christmas up his own tree!" 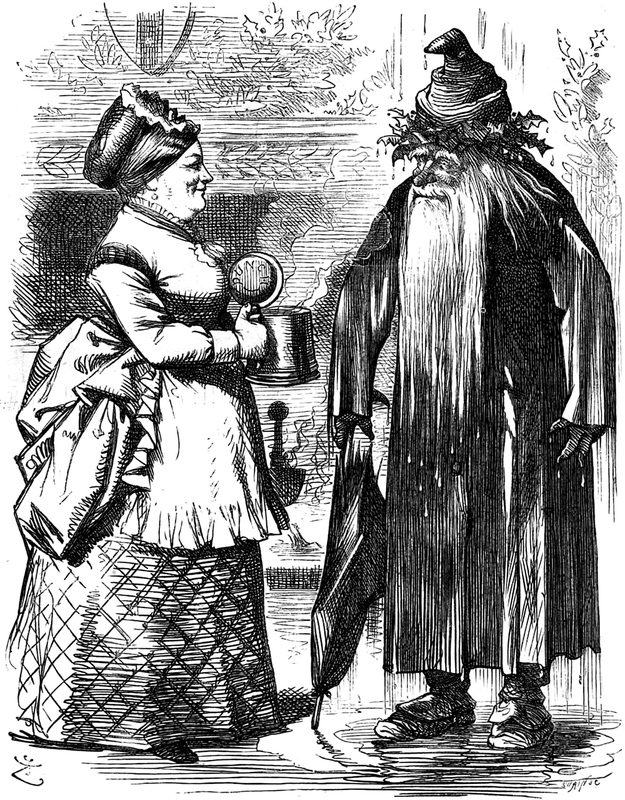 An illustration from an 1874 issue of Punch magazine. 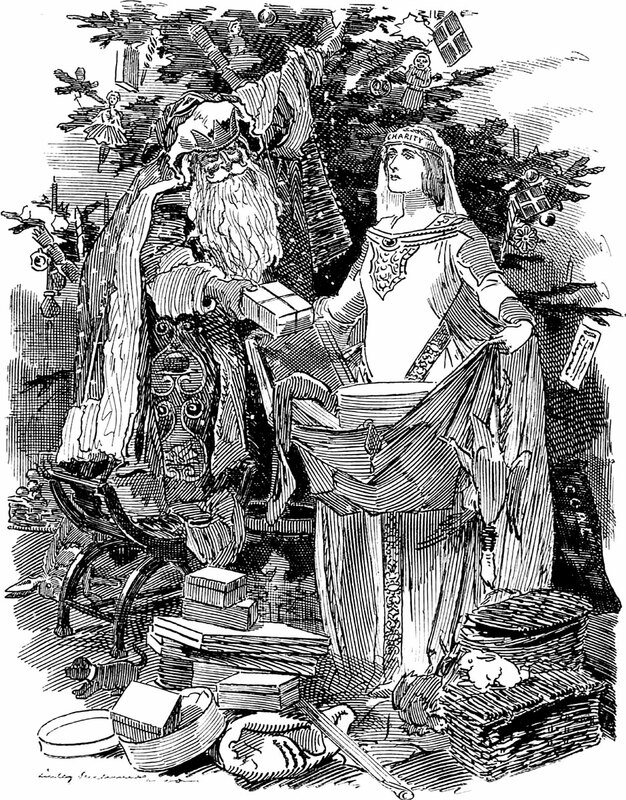 King Christmas and his Almoner: an illustration from a 1903 issue of Punch magazine. Who dances the frozen yule away? Why, it's the hearthstone goblins, of course! They teach the wind to sing and usher back the spring. They teach the gulls to scream and dance the ages into dream. From Cosmopolitan Magazine, 1893. This will also be of interest: The Collected Lost Meanings of Christmas. > read more from Book of Whispers . . . It's a nearly-forgotten fact that too much mistletoe can actually prevent kisses. Our proof appears in The Quiver, 1892. This will also be of interest: The Collected Lost Meanings of Christmas. 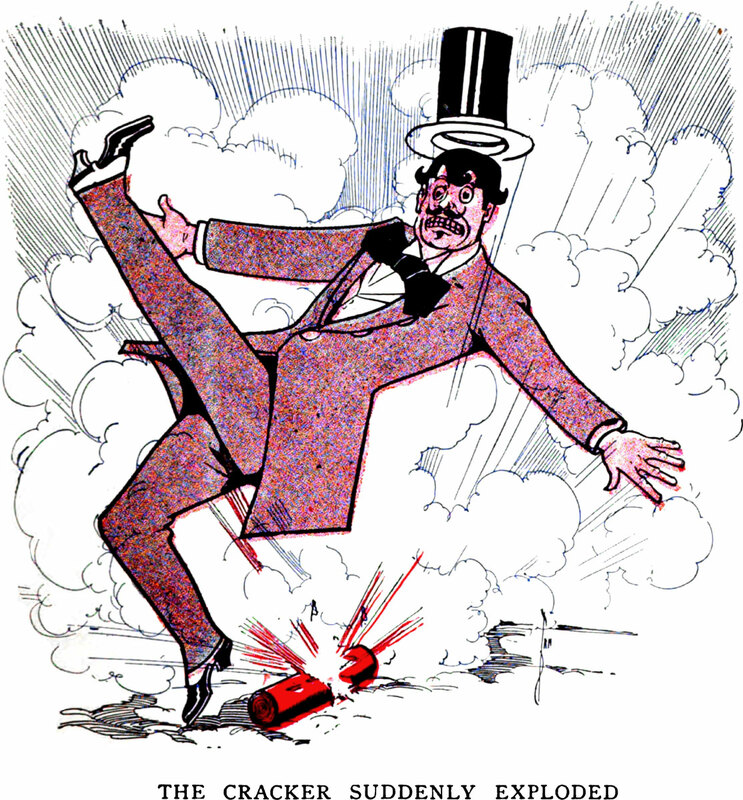 An illustration from a 1912 issue of Puck magazine. Wet Santas are rare finds. This one is from Punch, 1872. Here's a precursor to the classic The Lion in Winter, in which Eleanor of Aquitaine says, on Christmas day, "Of course he has a knife; he always has a knife; we all have knives! It's 1183 and we're barbarians!" This will also be of interest: The Collected Lost Meanings of Christmas. 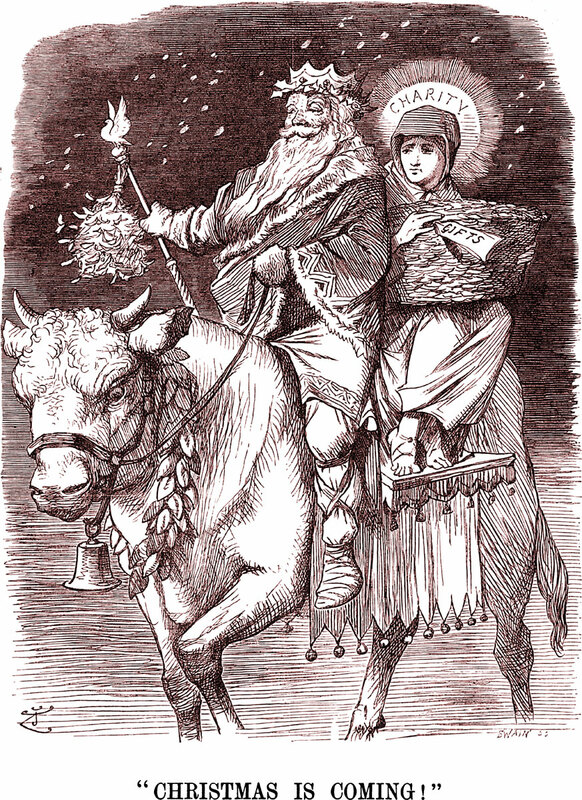 "One Christmas," from Pleasant Hours, 1888. 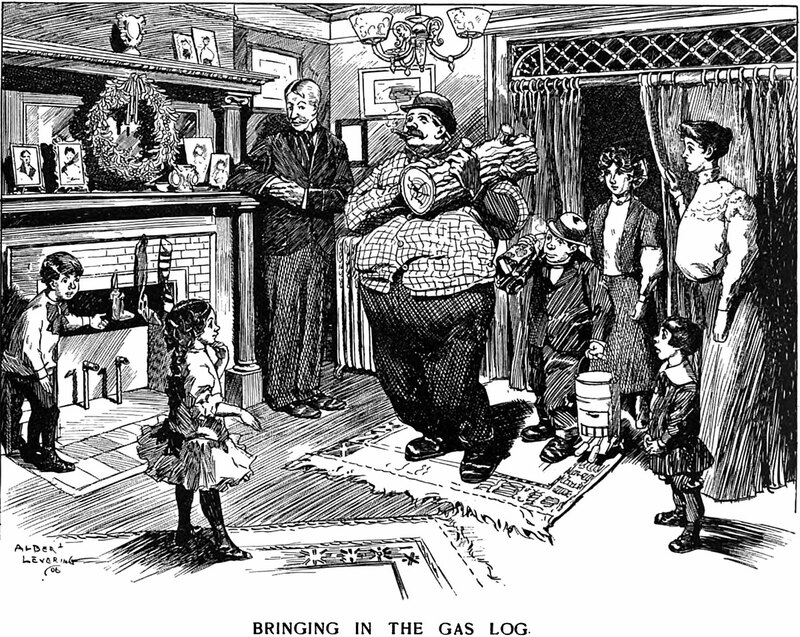 "Bringing In the Gas Log": an illustration from a 1906 issue of Puck magazine. "Christmas is Coming!" 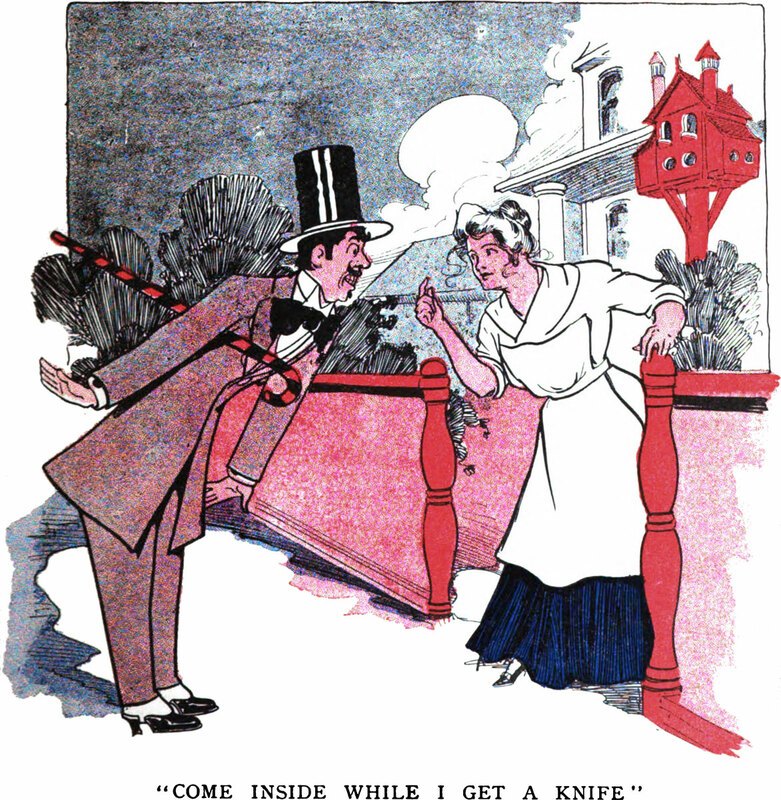 An illustration from an 1892 issue of Punch magazine. 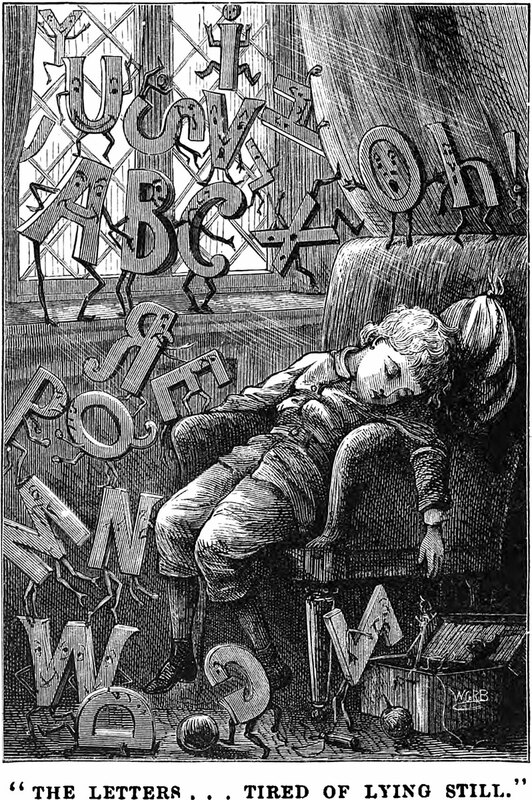 An illustration from The Burgess Nonsense Book (1901). See How to Believe in Your Elf. I dreamed of snowflakes and kisses under the mistletoe. > read more from Semicolon's Dream Journal . 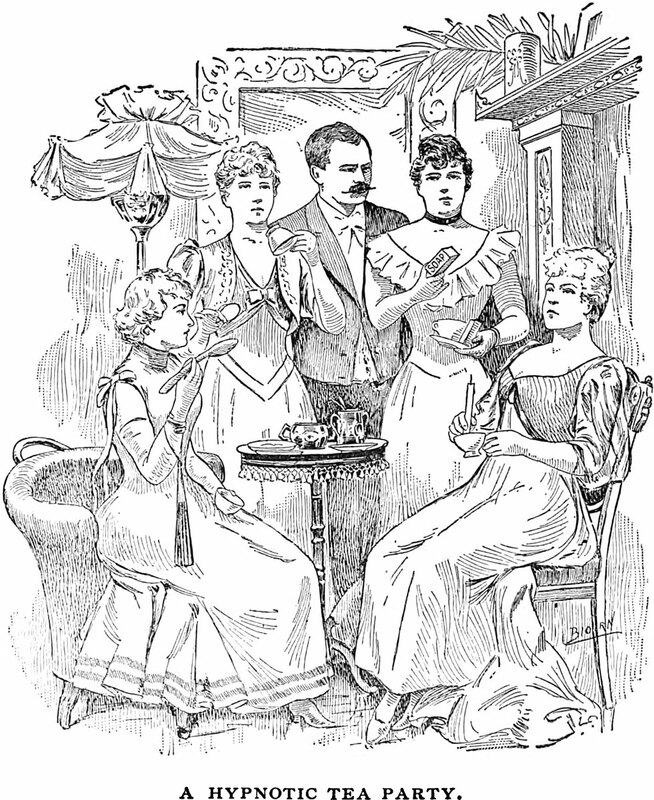 . .
"A hypnotic tea party": an illustration from Hypnotism: Its Facts, Theories and Related Phenomena by Carl Sextus (1893). 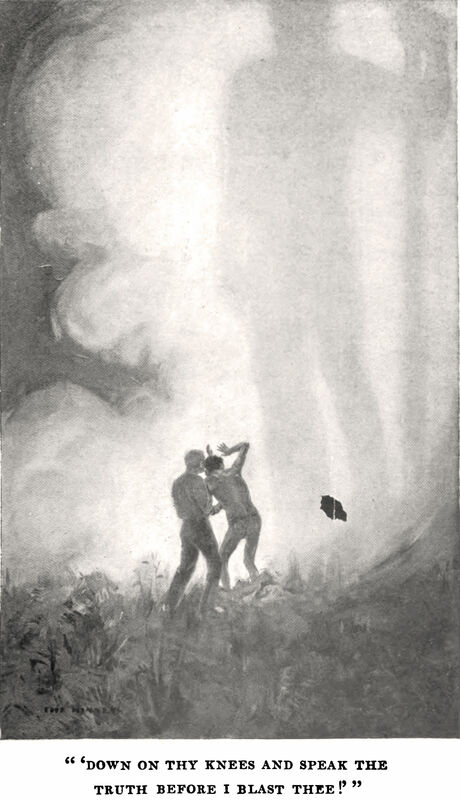 An illustration from The Mystery of June 13th by Melvin Linwood Severy (1905). The caption reads: "Down on thy knees and speak the truth before I blast thee!" 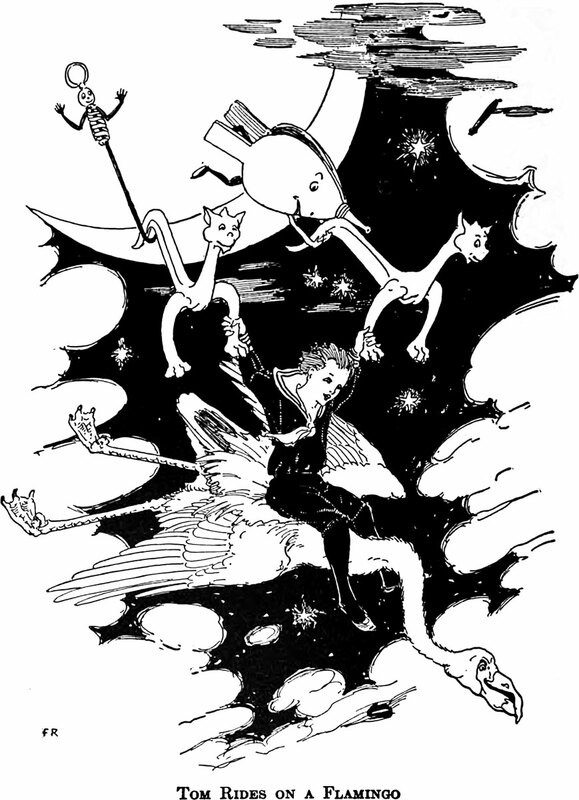 An illustration from John Dough and the Cherub by L. Frank Baum (1906). The caption reads: "The cracker suddenly exploded." "You may find it difficult to believe, but most people live their lives, to a large extent, out of their pseudo selves. It's very likely that you do this, too!" > read more from Apropos of Nothing . 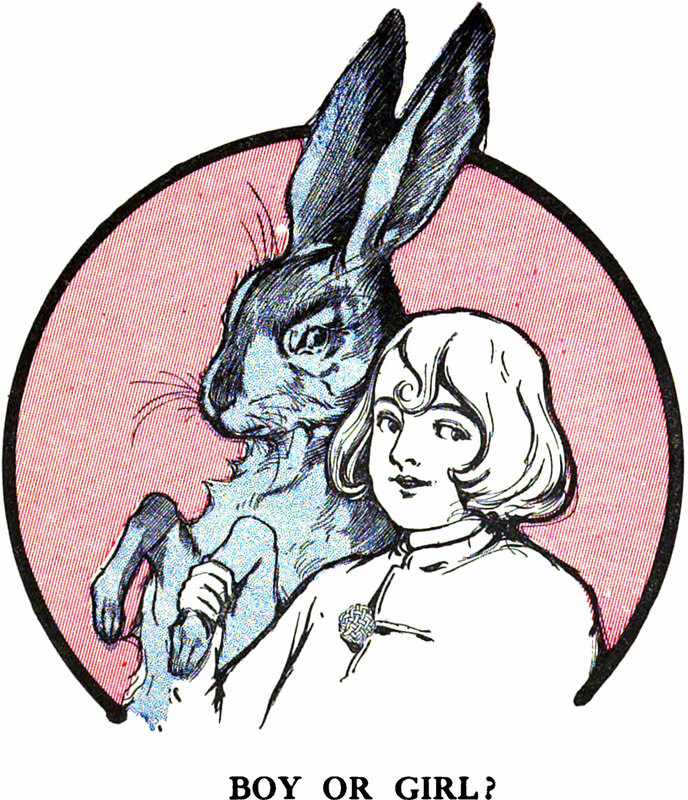 . .
A witch hare from Walter de la Mare's Down Adown Derry, A Book of Fairy Poems (1922). "It's best to be funny only if it comes naturally to you." This precursor to the Sorcerer's Apprentice segment of Fantasia appears in an 1885 edition of Goethe's Italian Journey. An illustration from The Wonder Clock by Howard Pyle (1887). The caption reads: "The Princess looks into that which she should not have done." "Romantically, you may be quite surprised when you finally remove your rose-colored glasses." 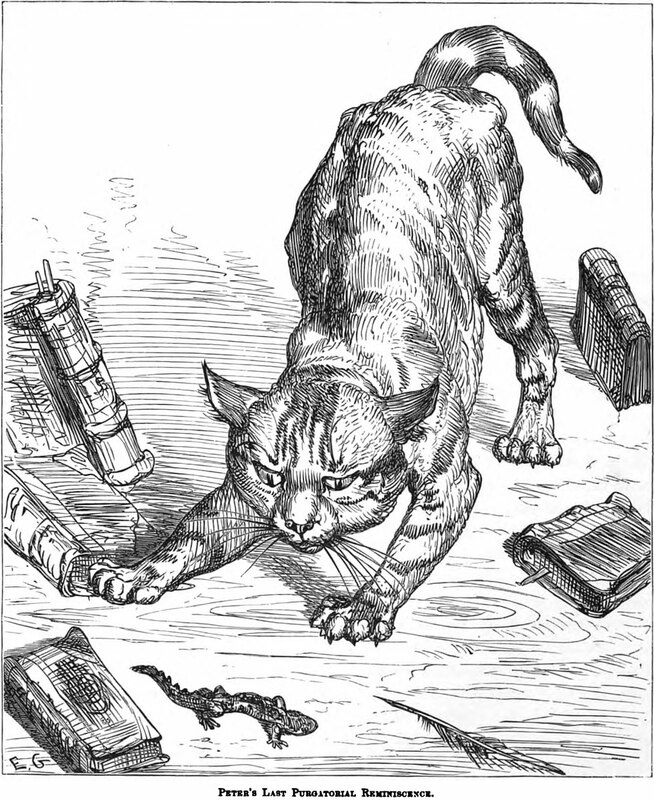 An illustration from Edward Lear (1862). Ice fairies from Punch, 1902. So many reasons for the season: old-school holiday yard decorations from The Principal Navigations, Voyages, Traffiques, and Discoveries of the English Nation (1885), via the British Library. This will also be of interest: The Collected Lost Meanings of Christmas. "Don't for a moment believe that no one will find out. That's the oldest trick in the book." > read more from Oldest Tricks in the Book . 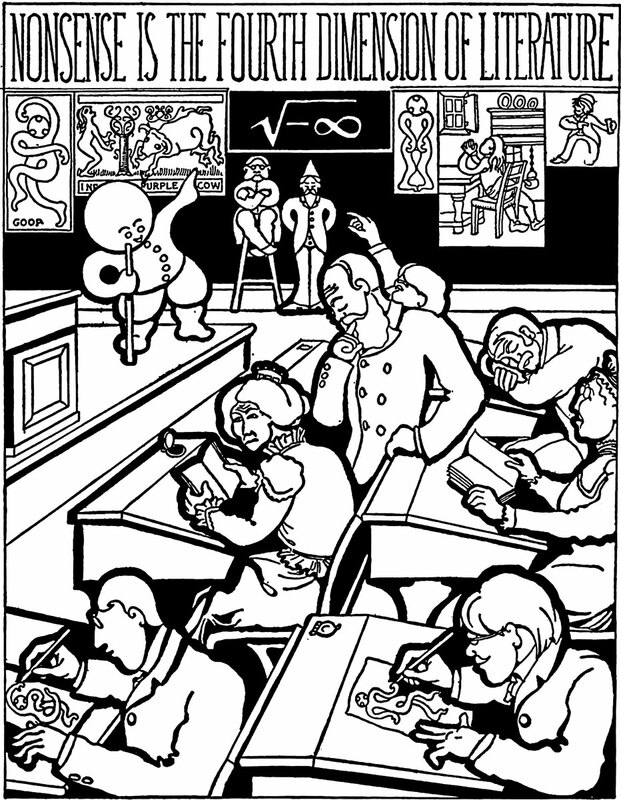 . .
An illustration from Hypnotism: Its Facts, Theories and Related Phenomena by Carl Sextus (1893). 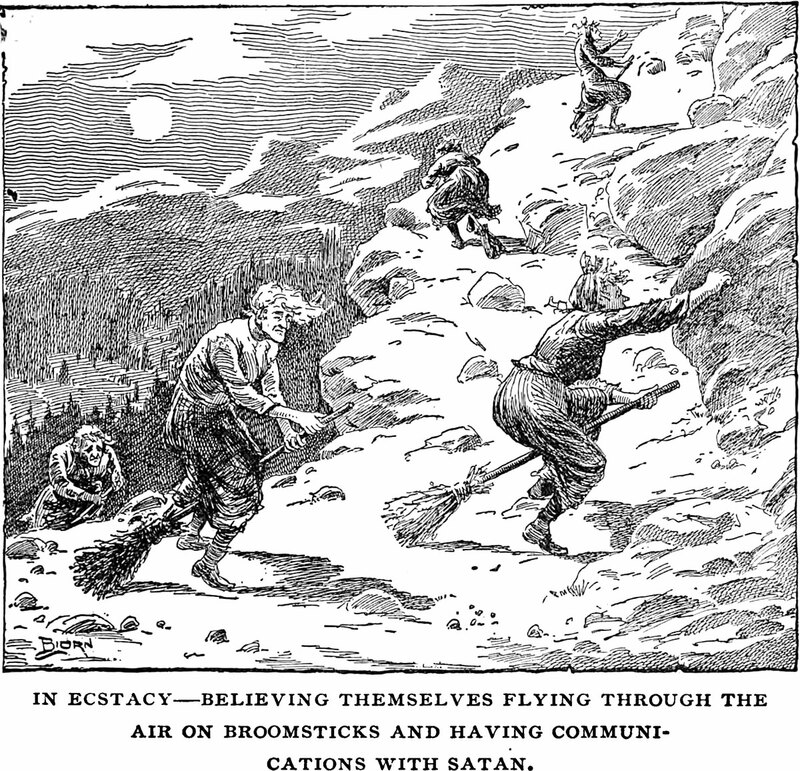 The caption reads: "In ecstacy—believing themselves flying through the air on broomsticks and having communications with Satan." An illustration from Ellis Parker Butler, Pigs is Pigs (1905). The caption reads: "Flannery is right, pigs is pigs." 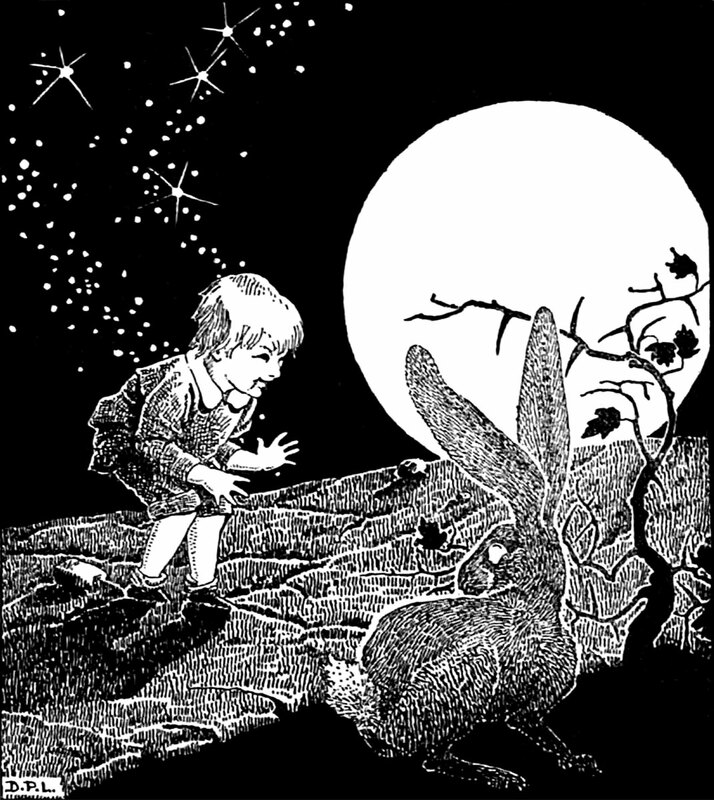 An illustration from The Burgess Nonsense Book (1901). 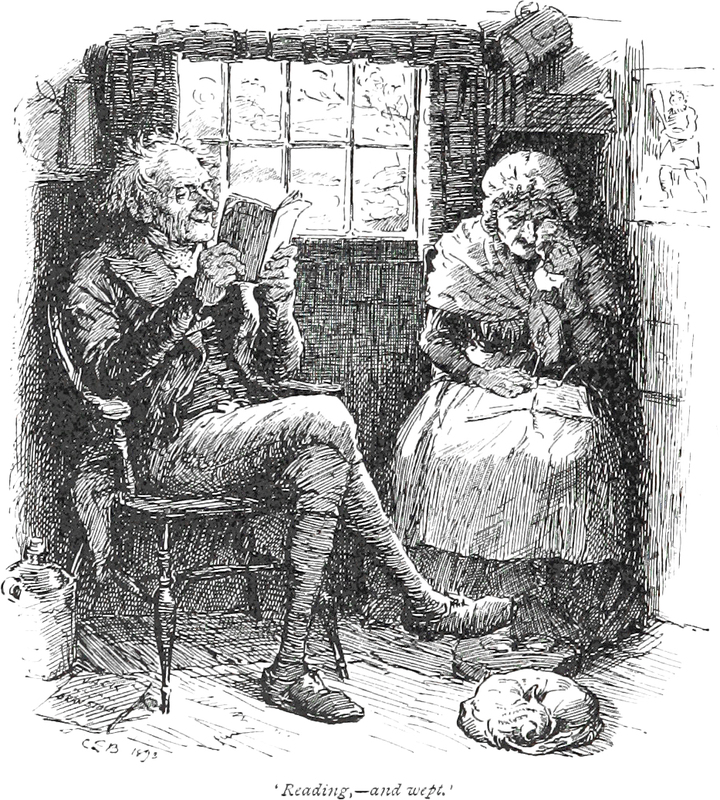 The caption reads: "Nonsense is the fourth dimension of literature." > read more from Nonsense Dept. . . .
An illustration from The Day of Wonders by M. Sullivan (1879). 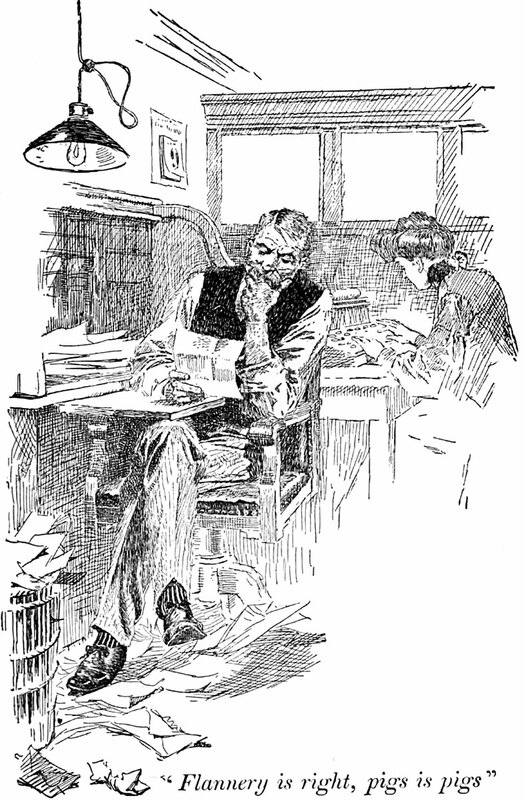 The caption reads: "The letters ... tired of lying still." 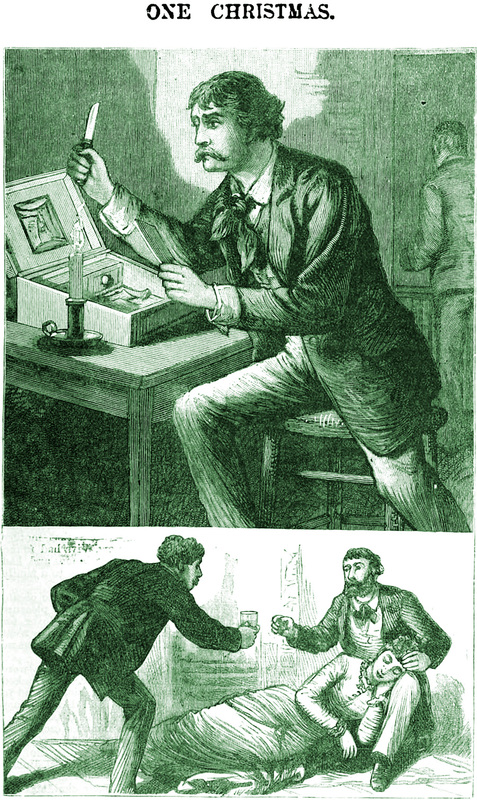 An illustration from Hypnotism: Its Facts, Theories and Related Phenomena by Carl Sextus (1893). The caption reads: "The subject dances 'Ta-ra-ra-bom-de-ay' with his sweetheart." "You may find it difficult to believe that you are capable of managing without someone to keep your life together." "I declared, apropos of nothing and with all the wisdom of my five or six years, 'The clouds are angels.'" 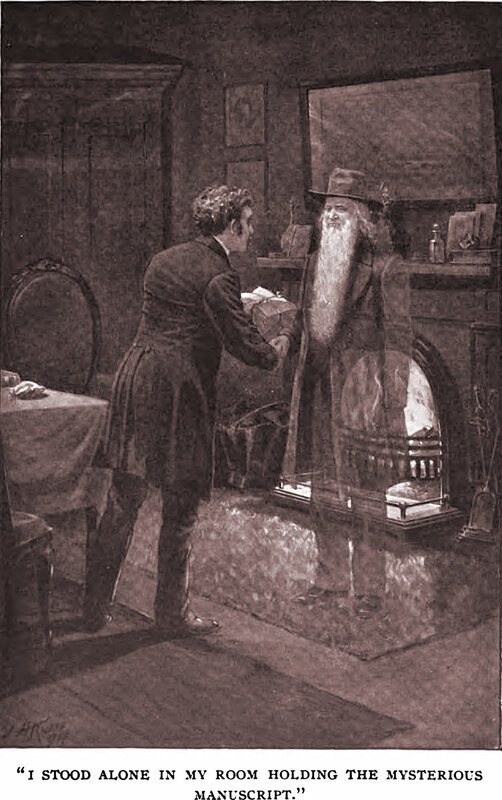 An illustration by Gordon Browne from Monitor at Megson's by Robert Leighton (1906). 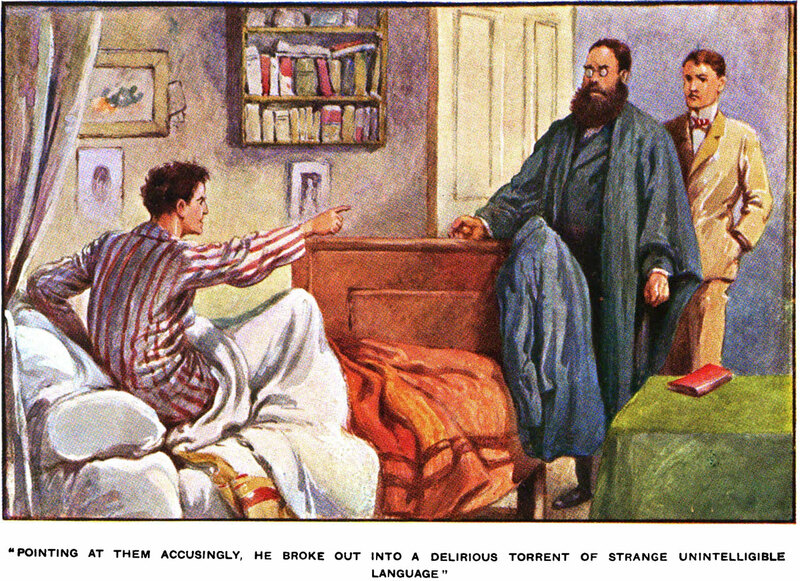 The caption reads: "Pointing at them accusingly, he broke out into a delirious torrent of strange unintelligible language." 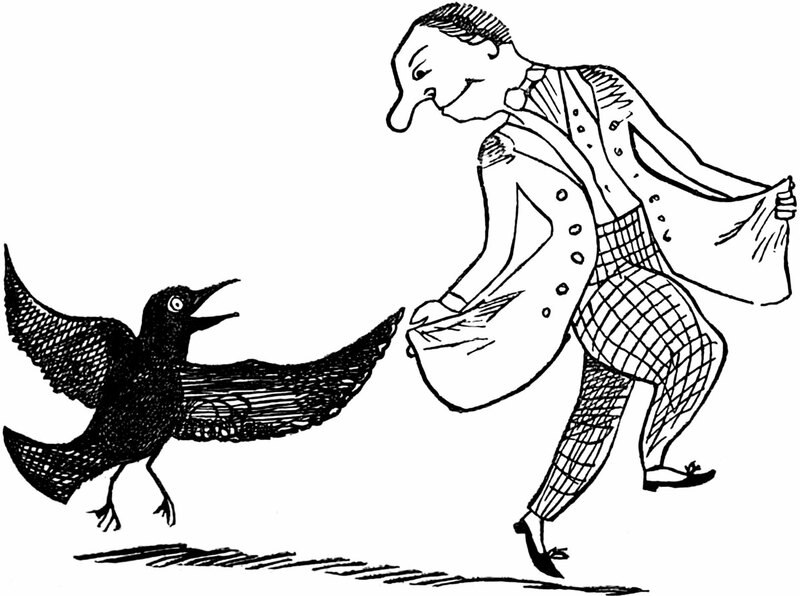 An illustration from William Makepeace Thackeray in Thackerayana (1898). "Boy or Girl?" An illustration from John Dough and the Cherub by L Frank Baum (1906). We won't deny it: we were disappointed to learn that this introduction to zoology was not — literally — illustrated by an artful crayfish. 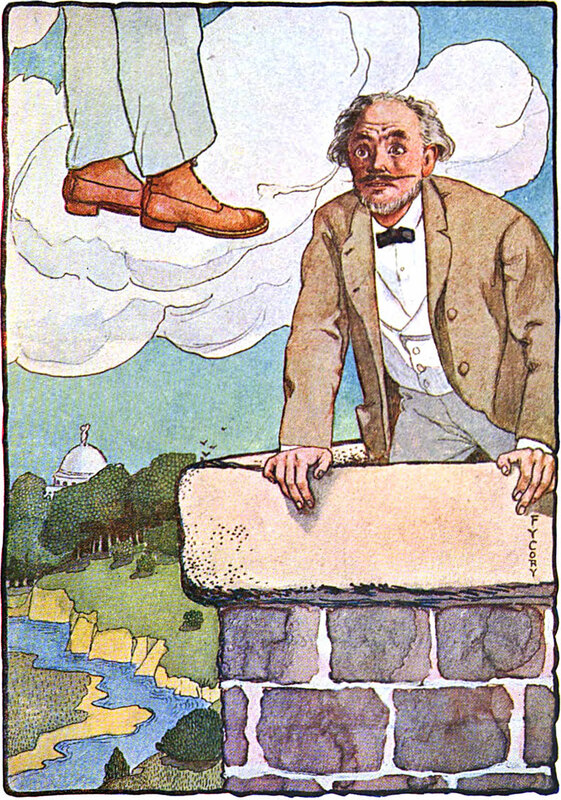 An illustration from John Dough and the Cherub by L. Frank Baum (1906). 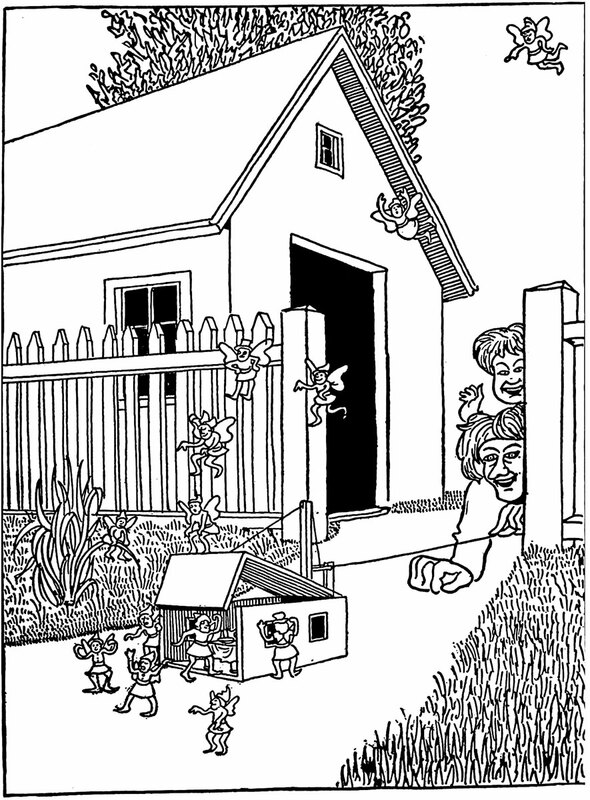 The caption reads: "Come inside while I get a knife." This lively portmanteau appears in Elm Grange; or, A Summer in the Country, by E. A. M. (1861). 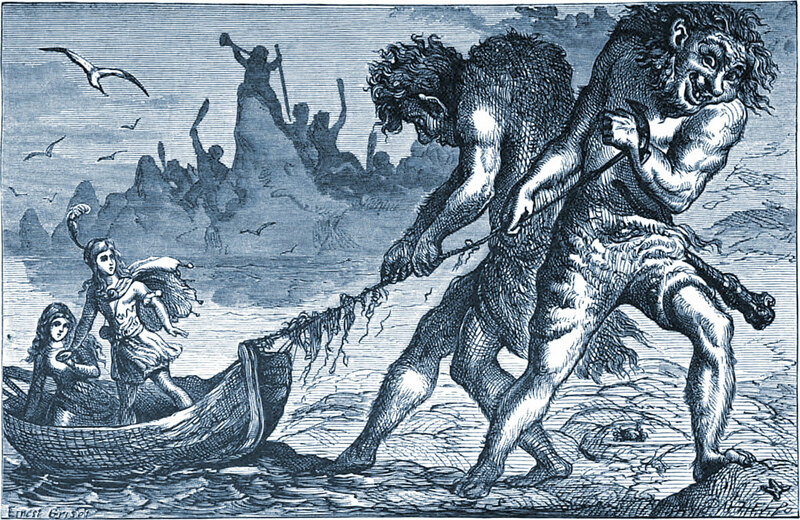 "The onslaught of the sea must be stopped." 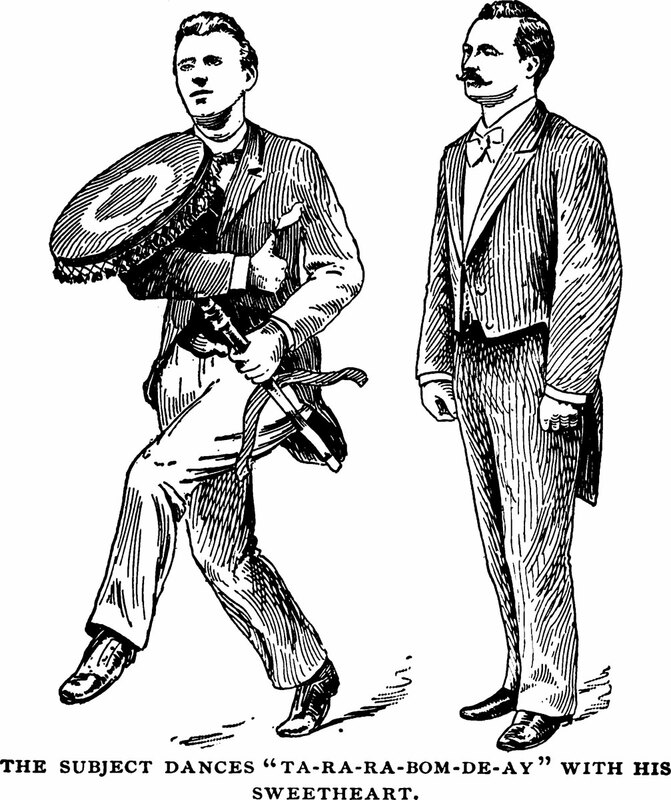 An illustration from Hypnotism: Its Facts, Theories and Related Phenomena by Carl Sextus (1893). 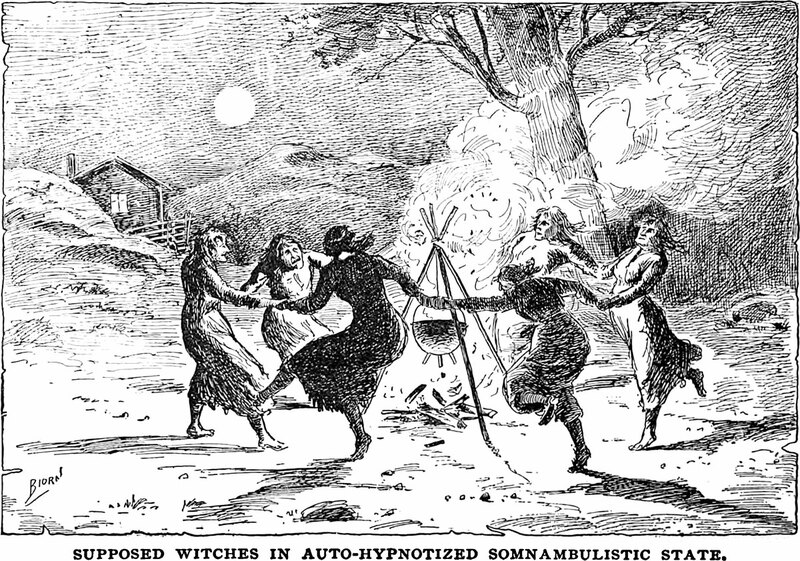 The caption reads: "Supposed witches in auto-hypnotized somnambulistic state." "Things are only funny if one understands the expected norms of a situation. This explains why young children often do not understand jokes; they do not know the accepted societal patterns of behavior well enough to realize when and how these patterns have been disrupted." 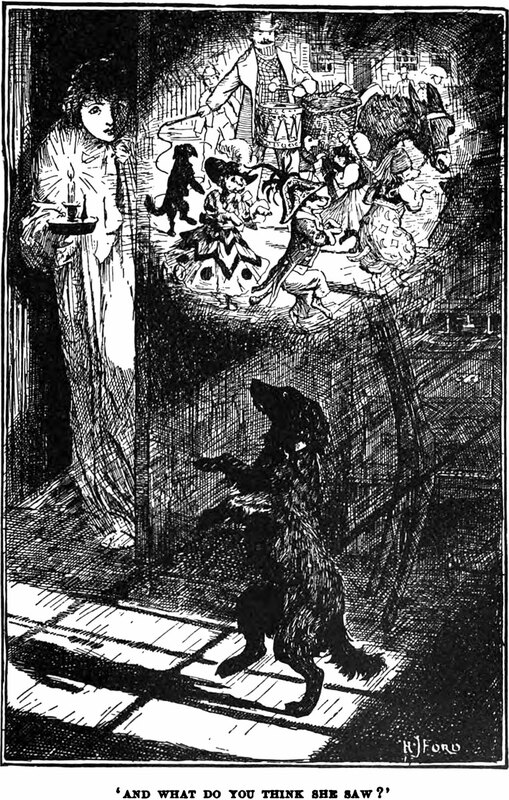 Illustration by H. J. Ford from The Animal Story Book by Andrew Lang (1914). The caption reads: "And what do you think she saw?" 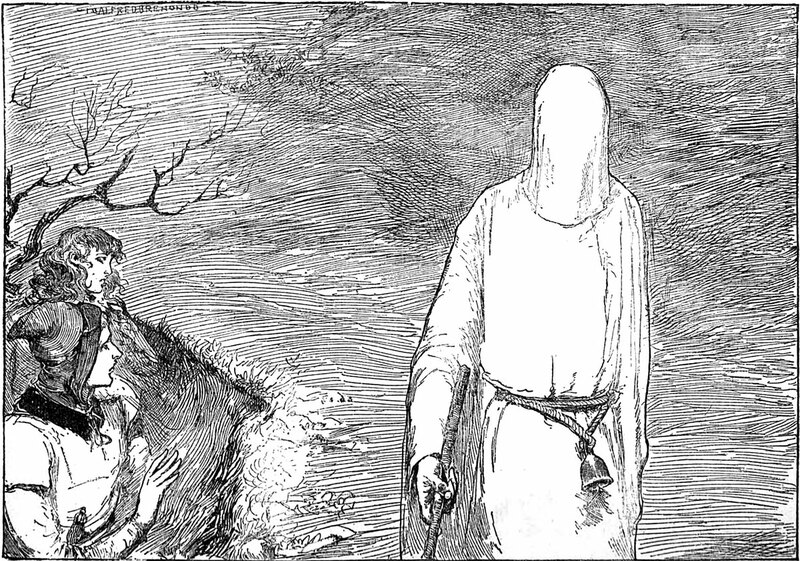 An illustration from Etidorhpa, or The Strange History of a Mysterious Being and the Account of the Initiate's Remarkable Journey by John Uri Lloyd (1895). The caption reads: "My heart throb is stilled. Sprung from the edge of the cliff into the abyss below, carrying me with him into its depths." 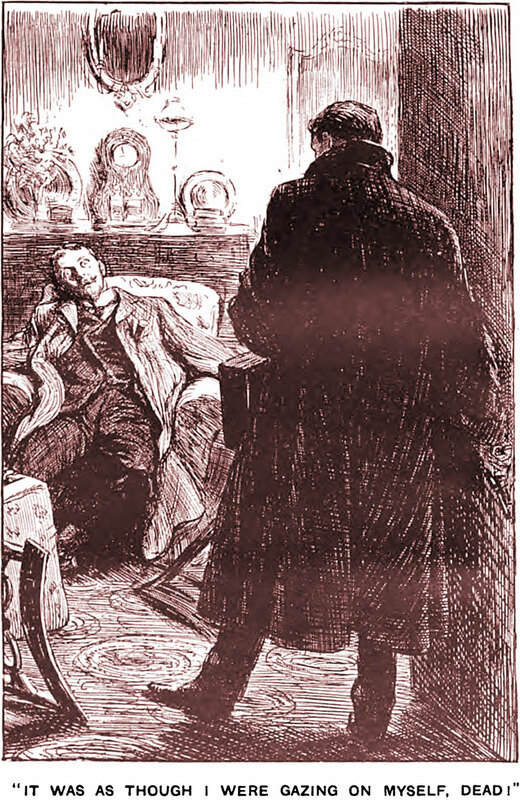 An illustration from The Man Who Was Dead by Arthur Williams Marchmont (1907). The caption reads: "It was as though I were gazing on myself, dead!" An illustration from Samantha at Saratoga by Marietta Holley (1887). 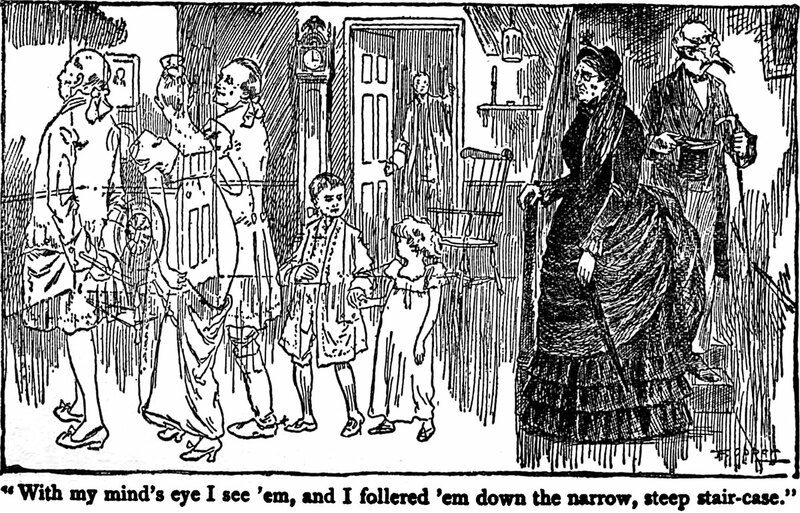 The caption reads: "With my mind's eye I see 'em, and I follered 'em down the narrow, steep stair-case." 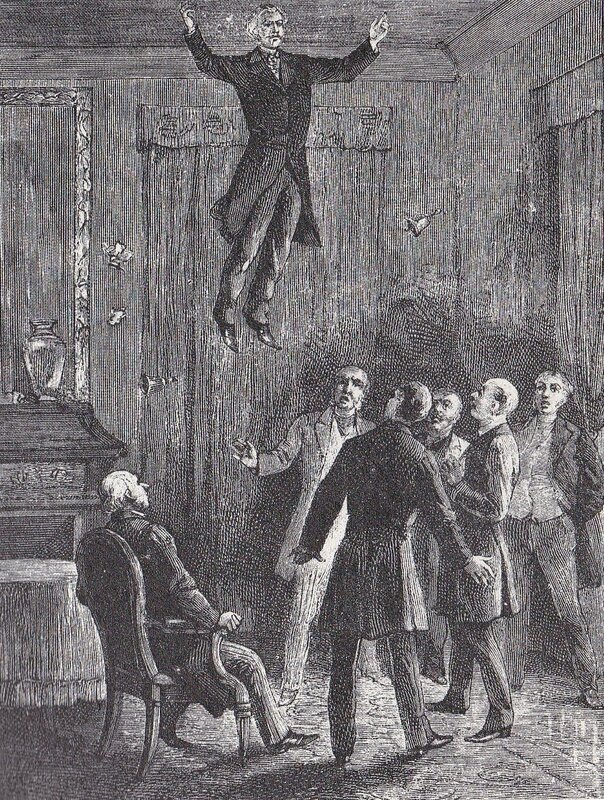 This is the Scottish medium Daniel Dunglas Home's levitation at Ward Cheney's house, from Louis Figuier's Les Mystères de la science, 1887. This should be of interest: Seance Parlor Feng Shui. 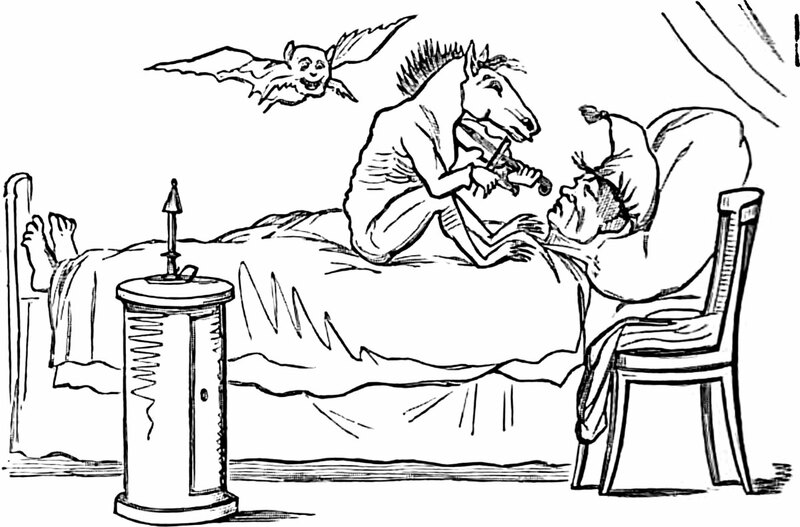 An illustration from Other Stories by E. H. Knatchbull Hugessen (1880). "You may find it difficult to believe that even a glittering new postwar refrigerator is capable of suggesting that its owner serve the one finest whiskey ever bottled." 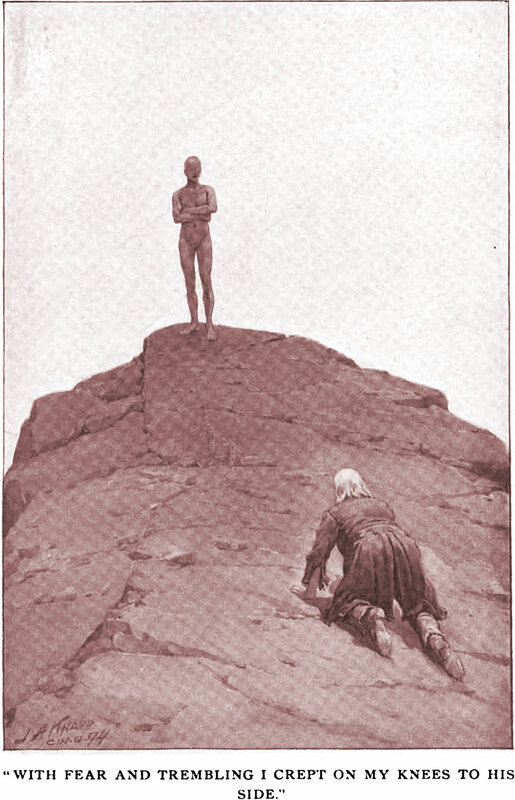 An illustration from Etidorhpa, or The Strange History of a Mysterious Being and the Account of the Initiate's Remarkable Journey by John Uri Lloyd (1895). 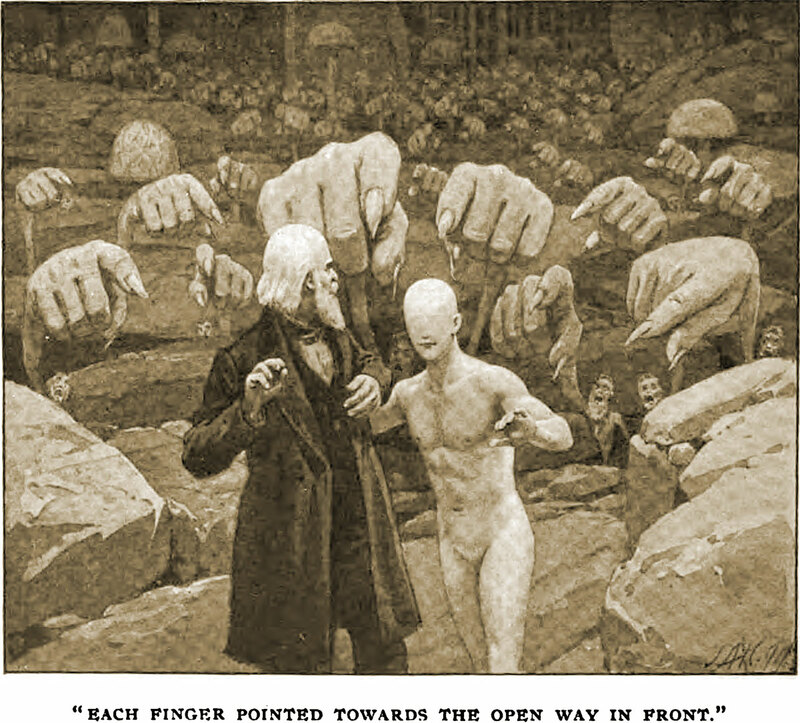 The caption reads: "Each finger pointed towards the open way in front." An illustration from Etidorhpa, or The Strange History of a Mysterious Being and the Account of the Initiate's Remarkable Journey by John Uri Lloyd (1895). 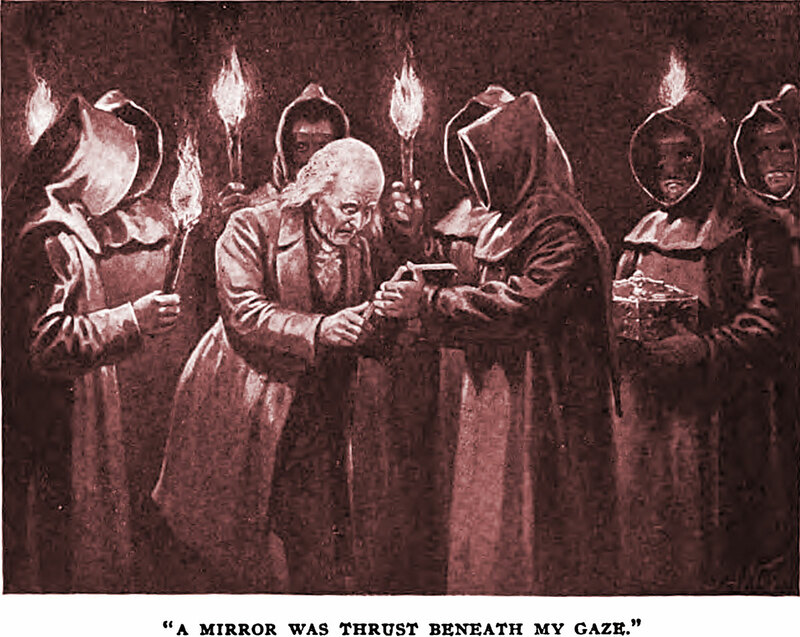 The caption reads: "A mirror was thrust beneath my gaze." 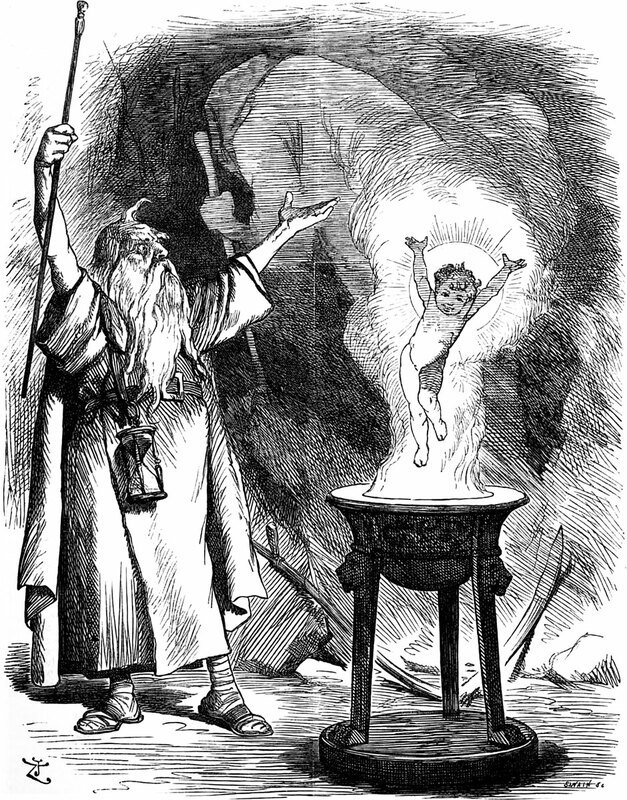 An illustration from Etidorhpa, or The Strange History of a Mysterious Being and the Account of the Initiate's Remarkable Journey by John Uri Lloyd (1895). The caption reads: "We leaped over great inequalities." "It will only be funny if Woody makes it funny." 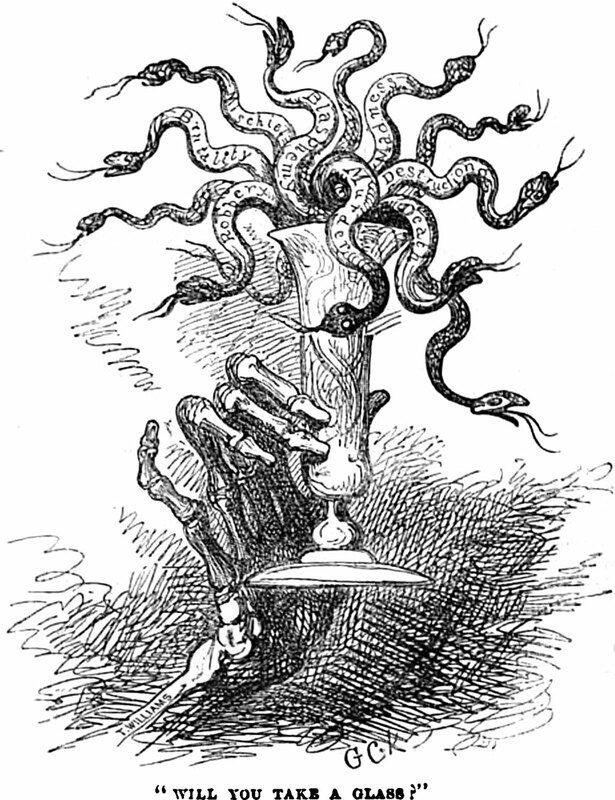 An illustration from Etidorhpa, or The Strange History of a Mysterious Being and the Account of the Initiate's Remarkable Journey by John Uri Lloyd (1895). The caption reads: "This struggling ray of sunlight is to be your last for years." 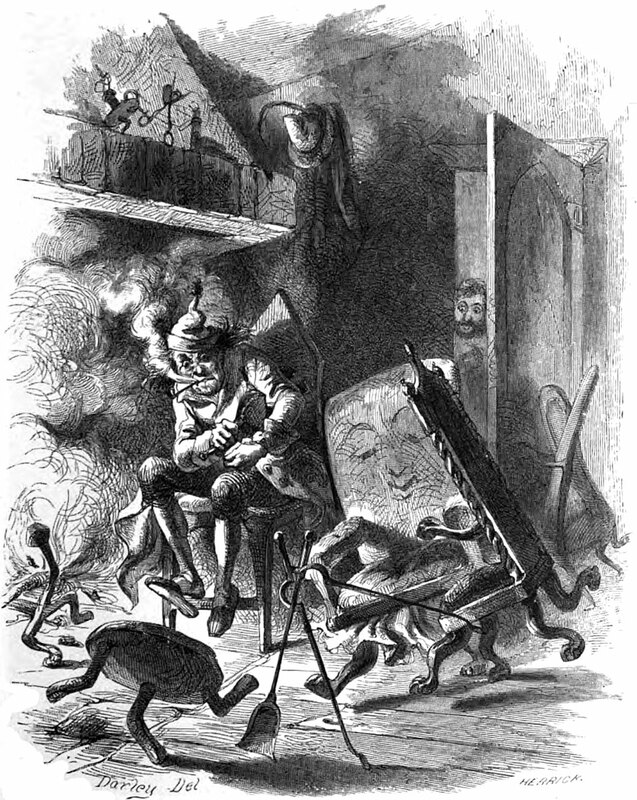 An illustration from The Purgatory of Peter the Cruel by James Greenwood. The caption reads: "Peter's last purgatorial reminiscence." This should also be of interest: How to Be Your Own Cat. Rumpelstiltskin is an anagram of "Purls silken mitt." An illustration from Etidorhpa, or The Strange History of a Mysterious Being and the Account of the Initiate's Remarkable Journey by John Uri Lloyd (1895). The caption reads: "I stood alone in my room holding the mysterious manuscript." "It is only funny if it is funny to an observer. But if something is only funny if it is funny to human beings, then it does not follow that therefore human beings are funny in themselves." 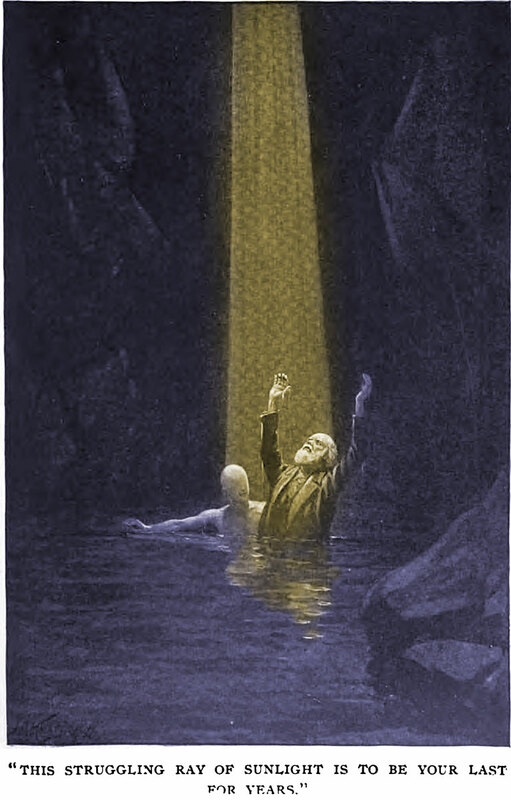 An illustration from Etidorhpa, or The Strange History of a Mysterious Being and the Account of the Initiate's Remarkable Journey by John Uri Lloyd (1895). The caption reads: "With fear and trembling I crept on my knees to his side." "Some change takes time. Give it the time it needs, and you may be quite surprised—and pleased—with the results."